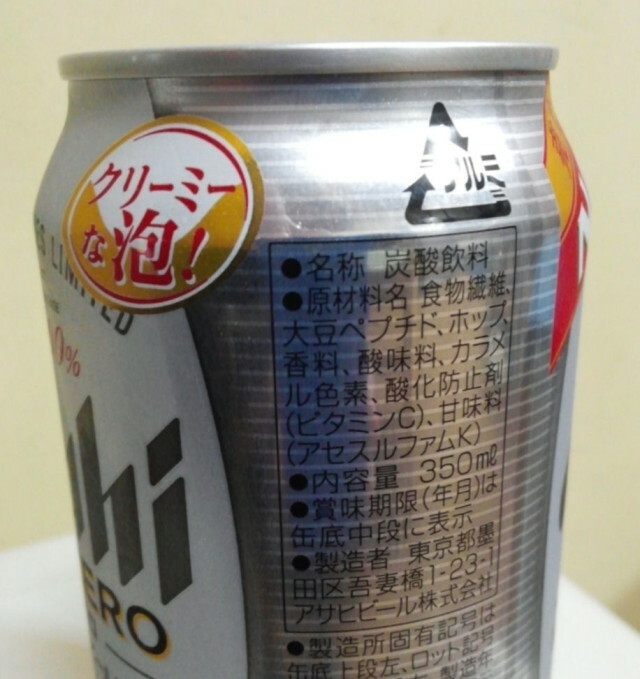 Asahi Dry Zero is a non-alcoholic (alcohol-free) “beer” that is made without a wort. Basically, that means it isn’t brewed… I think. It’s more like a soda, I suppose. That being said, when poured into a glass, it looks and smells a lot like beer. As far as taste goes, it’s one of the better non-alcoholic beers I’ve had. Asahi claims that Dry Zero is the best-selling non-alcoholic beer in Japan. Neither barley nor wheat is listed in the ingredients, so I’ve been drinking it for the last few months under the assumption that it’s gluten-free. 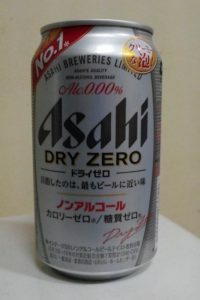 Miscellaneous: I usually add about 15-20ml of 190-proof grain alcohol (Spirytus Rektyfikowany or Everclear) per can when I drink Dry Zero, to more closely simulate real beer. 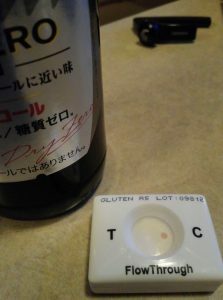 Test result: There is no indication of the presence of gluten. According to the instructions there should appear a clearly visible pink test spot on the left of the test area (T) to indicate the presence of gluten. But this test is negative. The pink spot on the right test area (C) is a control spot and indicates that the extract/sample is suitable, the test has been performed correctly, and all reagents are active. Even though the detection limit in this kit is very low (1-2 ppm) and the test is negative, please note this result does not constitute medical advice – please see Steffen’s facts page. I conducted two tests. The first time was with a can of Asahi Dry Zero, using the extraction solution provided with the kit. No gluten was detected. I wanted to be absolutely sure, so I contacted the people at Imutest, who told me that the test would be more sensitive without the extraction solution, so I ran the test again, this time with the bottled version, bypassing the extraction solution and adding the beer directly to the diluent solution. That’s why you see both a can and a bottle in the pictures. 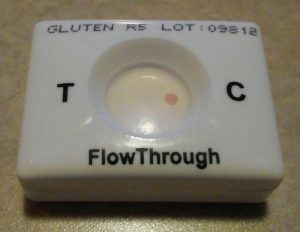 The results were negative (no gluten detected) in both tests. Also, Peter at Imutest was quite helpful (and patient) when I had questions about the testing process. Thanks for the test. First non-alcoholic beer and result negative in both tests. Also form and pics are awesome. Thank you for contributing. Can you buy this in the uk please?